Foxy Roxy, what a girl. In November 2005 we lost two of our senior girls. Oddly enough, both girls, Phoebe and Edie, had these wonderful overbites. We really missed the ladies, they both had added so much to our gaggle of greyhounds. I was doing the website for our greyhound group, one of the perks was seeing the dogs almost before anyone else. One of the incoming dogs was a nine year old brood mama, Roxy. She had an overbite. It was kismit. The following week-end we made a beeline for the adoption kennel. When Karen opened the kennel door, Roxy walked over and buried her head in Karen’s chest. We knew at that very moment that Roxy was coming home to the gardens. Brood mama’s have a special relationship with all of the other greyhounds, they just don’t take any crap. It must have come from keeping all of the puppies in line. Roxy had laid claim to the cushion under my desk, the cushion under the kitchen table and the cushion right beside the couch. Where ever we are, she is. Wandering the acre is her pleasure. 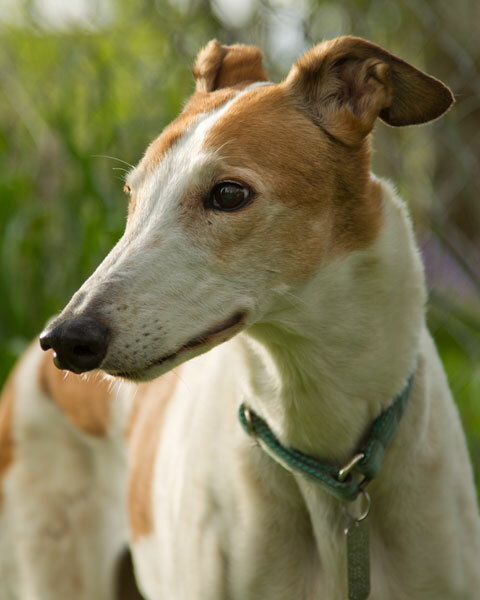 Roxy is just one more opportunity to say that adopting senior greyhounds is the best thing we ever did.